In the first part I showed how to control a single LED from an app created in App Inventor. This worked OK but was very limited. You could control only 1 LED and the control was one way; from the app to the Arduino. What if you want to have 2 way control of the LED and to be able to also control the LED from the Arduino side? What if you want to control more than 1 LED? In this guide we look at adding two-way communication. Here we control an LED but you could have it doing anything. In first example you could only control the LED from the Android app, here we extend the example so that we can also control the LED at the Arduino side. 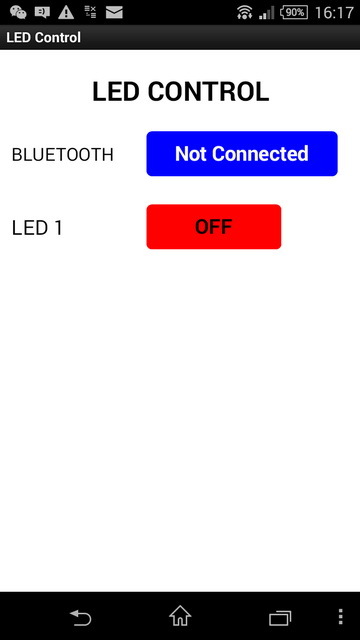 When the LED is turned on or off by the Arduino we want the button in the app to update to show the correct LED status. The first example used methods only suitable for controlling one LED, this time we will try to make it so the Arduino sketch and also the AI2 app can be easily scaled and so once you have the basic app in place adding extra buttons and controls should be fairly straight forward.